Silver Mother's Necklace from Landstrom's Black Hills Gold. 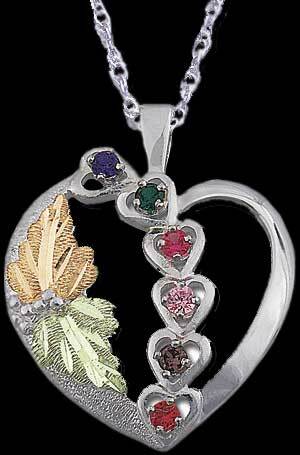 Up to six gemstone-filled silver heart cascade over the front of this open sterling silver heart pendant with Black Hills Gold leaves. Genuine or synthetic birthstones are available. Arrives in an attractive clamshell gift box and complimentary 12 karat gold filled chain. Ships in 10 working days or less. Basic pricing shown is for two synthetic stones. Each additional synthetic stone is $8 and each additional genuine stone is $16. Note: synthetic stones are not fake; they are chemically and physically identical to natural stones. This mother's necklace is guaranteed for life by the leader in Black Hills Gold jewelry, Landstrom's Black Hills Gold. Stone types may not be mixed; please order only with all genuine stones or all synthetic stones. Lifetime Guarantee: If there is a defect in materials or manufacturing, your mother's necklace will be fixed or replaced by Landstrom's Original Black Hills Gold Creations free of charge.